The icons left to right on the Tool Bar are Select Schedule, Edit Schedule, Update Game Scores, League Schedule Report, Team Schedule Report, Master Schedule Report, Audit Report, Standings Report, Print, Internet Options, Publish League Website, Frequently Asked Questions, and Help. 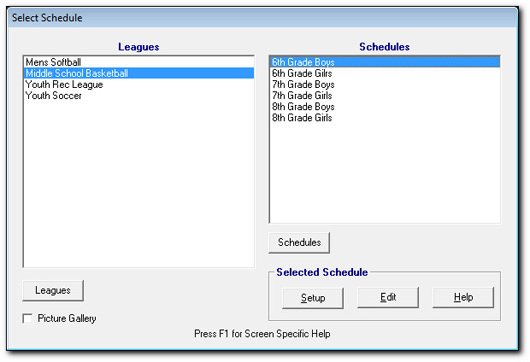 The Select Schedule screen comes up automatically when you start the program. There's a sample League and Schedule provided for you to experiment with. You can add any number of leagues. And you can add any number of schedules to a league. Once you've added your league and schedule name and contact info, click the Setup button. Enter all the schedule parameters by clicking on each of the six parameter buttons: Locations, Teams, Start Date, Game Times, Exceptions, and Options. 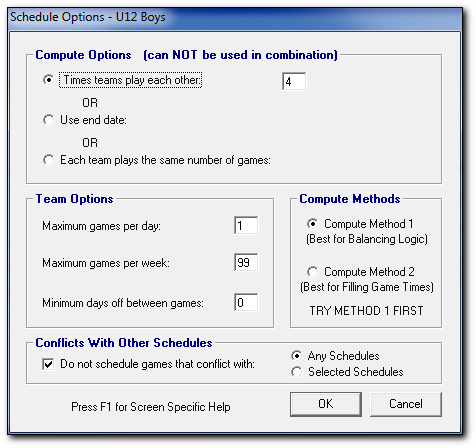 Then click the Compute button and the program computes the entire schedule according to the parameters you've supplied. After your schedule is computed, you can view the reports generated. Here's a sample League Schedule report. The team number, name and contact information are displayed at the top of the report. Game dates, times, locations and team matchups are displayed in the body of the report. Print the report, export it to Word, or publish it to your free league website. 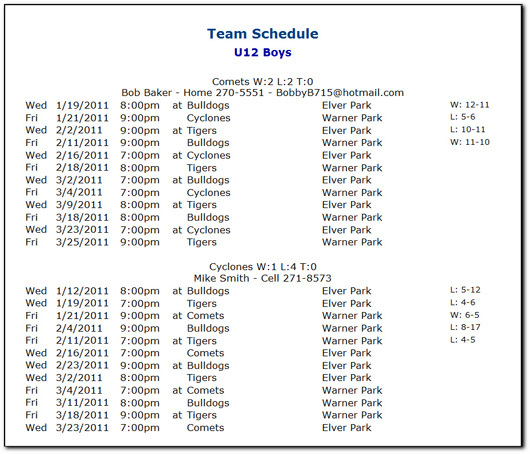 Here's a sample Team Schedule report. 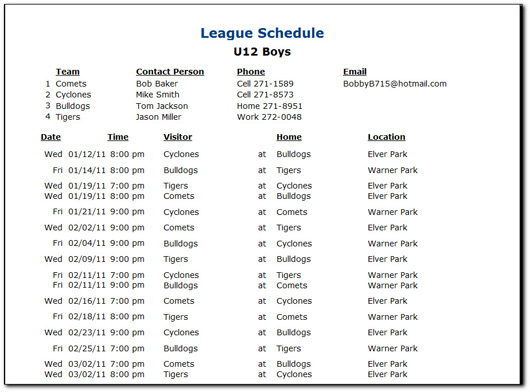 Schedules for each team in the league are displayed showing game dates, times, locations and opponents. Print the report, export it to Word, or publish it to your free league website. Here's a sample Standings report. Teams are listed in order of win percentage. Print the report, export it to Word, or publish it to your free league website. Let's go back and take a closer look at the parameters of the schedule. The Locations screen is where you add locations and assign them to a schedule. 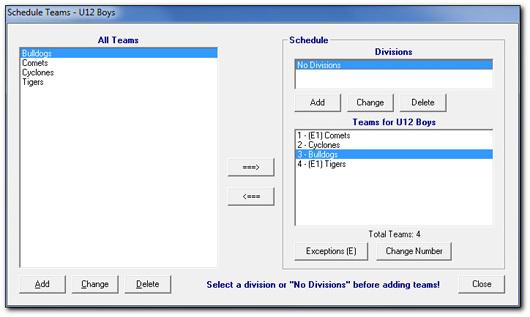 The Teams screen is where you add teams and assign them to a schedule. You can add up to 40 teams to a schedule. Click the Exceptions button to enter team specific exceptions (see screen below). Enter exceptions specific to a team on this screen. You can enter in date exceptions to block out dates for a team so they won't have any games scheduled that day. You can also enter day of week and time time exceptions. 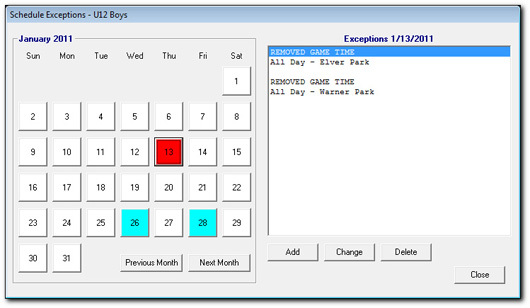 Exceptions for the entire schedule are entered on the Schedule Exceptions screen. 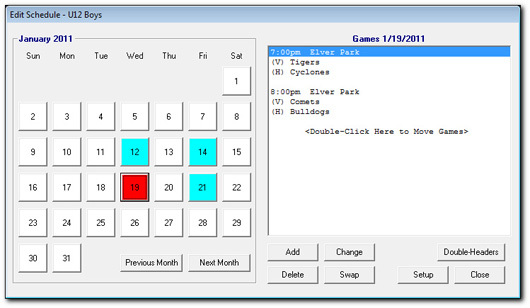 The Game Times screen is where you enter weekly game times used to compute a schedule. 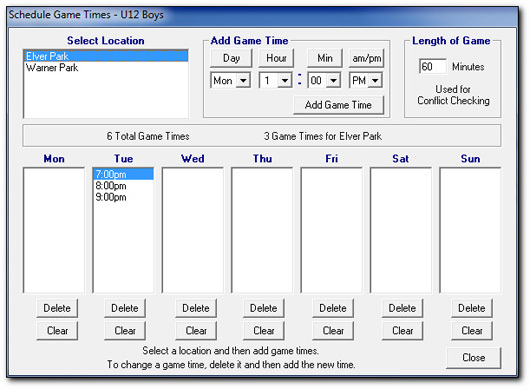 You should enter game times for each location or team, depending on which schedule type you are processing. For regular schedules, game times are entered for each location. For traveling league schedules, game times are entered for each team. The Schedule Exceptions screen is where you add exceptions that apply to the entire schedule. For example, you could remove all game times for July 4th or add an extra game on March 3rd at 8:00pm. Note the compute options can not be combined. You must choose one. Either the number of times teams play each other, or the end date, or the number of games each team plays. Remember you can always do some manual fine-tuning to your schedule after it's been computed. On the Edit Schedule screen you can change individual games. Click on the Swap button to select any two games on the entire schedule and swap the team matchups. You can also add double header games. 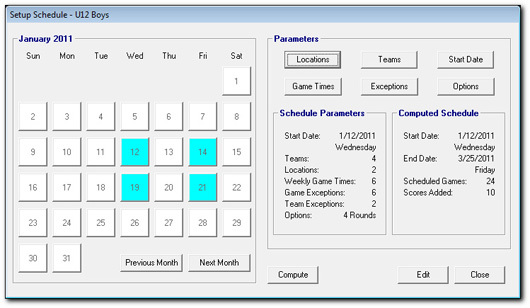 Included in your purchase of League Scheduler is your own free league website. The Internet Options screen is where you select the reports and pictures to include on your website. Use the tabs along the top of this screen to navigate. Add custom text on the Page Content tab. Select Publish Website from the Internet Menu to create your website. You're prompted for a name the first time you publish. You can re-publish anytime to update your website as the season progresses. Email your website link to your league. This is a great way to keep everyone up to date.